Mobile bases are terrific. I like being able to move a tool to the location of the work, or, sometimes, just move it in order to clean. When our Sears store had a local repair center, their dumpster was sometimes a gold mine. They would throw out things that seemed to be perfectly useful. One day I’d been there to drop off my dehumidifier for annual maintenance, when a grey object caught my eye. I wheeled around to check and, sure enough, a Craftsman tool stand was just outside the dumpster. As the proud owner of a Craftsman radial arm saw, I thought I’d pick it up in case I wanted to mount the saw on it. I’d already built the saw into my “saw table,” but it was a prize too good to pass up. Over time, the stand was in my way, and I was happy with the saw table setup, so I started looking for other uses. It seemed ideally suited for a grinder, so I took a scrap of plywood and bolted it securely. To the plywood I attached my little Craftsman grinder. It was a good working height as- is. For many years after I started woodworking, I was a terrible sharpener. In an effort to improve, I looked at a Work Sharp 3000 Sharpening Center, Scary Sharp sandpaper and several Tormek sharpening options. While I’m convinced that Tormek is worth every penny, I just couldn’t quite convince myself to drop the necessary coin. Since Steven Johnson’s excellent video on the Tormek T-4 Sharpening System, I’m now a believer, but I was already committed to a slow-speed grinder. When my Steel City slow-speed grinder arrived, I was at first elated, then deflated. During shipping, the grinder must have fallen on its left side, because there were several parts bent. I called the company, and they were glad to take care of the problem. In fact, they sent me an entirely new grinder, and didn’t even want the old one back! I couldn’t be happier with the replacement. It was easy to unbolt the Craftsman, move it 90i, and have grinders back-to-back. As Christmas approached, my wife asked me repeatedly what I wanted. Since I didn’t need anything, it was hard for me to produce ideas, but I settled on a DMT diamond plate and a universal mobile base. 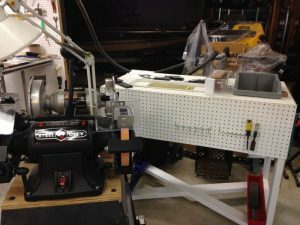 In no time I had a moveable grinder setup that could follow my wet sharpening system around the shop whenever and wherever they were needed. Mounted on a mobile base, this grinder setup is ready to go wherever the work is, or just get out of the way of an oncoming vacuum cleaner. yes trick is ideal for a sharpening center. Really an intelligent trick.